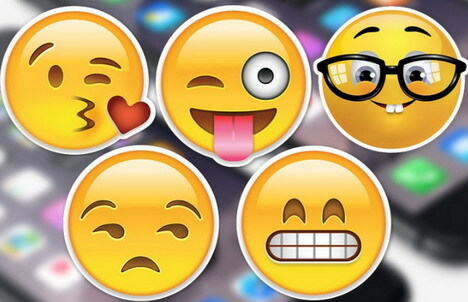 3 ways to get iPhone emojis for Android to express your emotions. Home How To 3 ways to get iPhone emojis for Android to express your emotions. We all use emojis in our every post, chat, update and now even we are using them in our selfies too, but there is down point in Android platform. In iOS or iPhones the update of emojis comes very fast, they update everything quickly and provide new emojis to the users but in Android, the rate of update is really late. But there are some methods by which we can use iPhone emojis for Android. But before going further on the topic of iPhone emojis for Android let’s discuss Why do you want this ? Why do you want iPhone emojis for Android? There are many new emojis are available in iOS as compared to the Android. Emojis in Android looks unusual and we can’t see the precise expression of the emoji. They look flat and we can’t understand what the actual emoji is. But where did emojis come from? These are originated from Japan you can guess by its name. The father of the emojis is Shigetaka Kurita. How to get iPhone Emojis For Android? You can see all the emojis on the WhatsApp because WhatsApp is the only application which got all the emoji updates as they released by Apple. There are three methods by which you can get iPhone emojis for Android. But for that, you need to check whether your smartphone can support this new emojis or not. This is only possible in the smartphone which is greater than the 4.4 (Android KitKat). Because Google releases emojis over the Android versions of KitKat. If you are seeing a post that has many emojis but in some of the emojis, you are seeing the squares that mean your smartphone doesn’t support that new emojis. You can check whether your smartphone supports emojis by doing a web search. Go to the web and search for “emoji” if you are seeing the emojis in this search result then your smartphone supports emojis & if you are seeing some squares that mean your smartphone doesn’t support emojis. If your smartphone doesn’t support emojis.you can still use them by using third party social media apps like WhatsApp or Facebook Messenger. If your Android device supports emojis but your default keyboard doesn’t have then you can use some other third party keyboards which have emojis and you can do this by navigating to settings > language and input > default and then choose the keyboard that you want to use. There are many third party keyboard that you can use like Google keyboard or G-Board, Swype, SwiftKey etc. 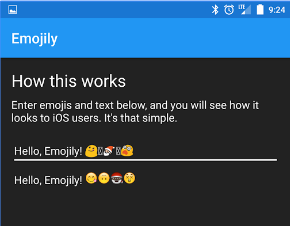 You can compare the Google emojis and iOS emojis by an Android app called Emojily, this app doesn’t help you to get iOS emojis but you can get a preview how the iOS emojis appear and check out the difference. How to get iPhone emojis for Android smartphone which is rooted? There are two methods by which you can use an iOS-like emojis in your smartphone as default. First method is simple and can be done very quickly & second way is quite difficult and requires some in-depth Android knowledge. But Before proceeding it Read this article to know the disadvantage of Rooting. There is an application which you can find on the Google Play Store of name “Emoji Switcher“. By this application, you can use any iOS emoji in your smartphone as default but this required root access. Go to the Play Store and search for emoji switcher. Tap on the download button and wait for the complete download. Open the application after complete downloading then select the option “set emoji to“. This application is very simple to use, there are so many options available in this application, you can use LG G3, Samsung S4, and IOS emojis from there. Select the iOS option because we are discussing iOS emojis here. When you click on the set option then this application requires a reboot, click on the reboot option and then you can use IOS emojis in your smartphone as default. 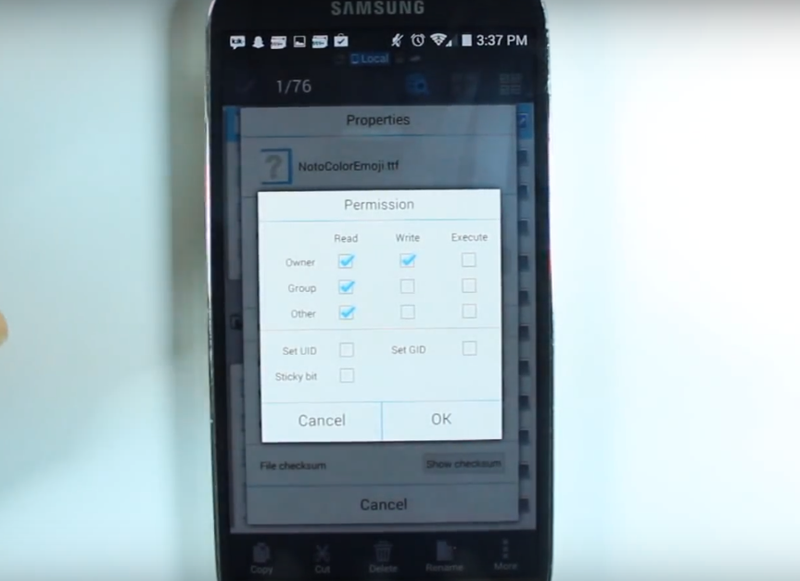 For doing this method you need to download an app called ES File Explorer and a file(Download Link) that you need in this procedure. You need root access to the ES File Explorer. Go to the folder where you downloaded the file and Copy the file. Navigate to Device>System>Fonts. Device means your Root Storage or We can say Internal Storage. Now you will find the same named file (NotoColorEmoji.ttf). You need to overwrite that file. But before going further make a copy of that inbuilt file, so that if there will be mishappening goes you can paste it right here again. The file that you downloaded paste it to the fonts folder and click on overwrite. It will replace the old file with the new one that you pasted. One thing that you will notice that all the other files in the fonts folder sales rwrr so if you place this file right there it was a rwrw which is not correct, now hold down on the file that you pasted then Navigate to More>Properties>Permissions>Change. See the down image and tick on the boxed where the below image shows. Then click on Ok. After that, you need to reboot your smartphone and then you can check your emojis section on the keyboard it will change to iOS emojis. If you see blank on the images section then you probably didn’t do the permissions section right. Somehow, if you want the Android emojis back, you can paste the file that we made a safe copy in the first step. Paste the safe copy file into the fonts folder and your old emojis will back. If you find some problem in the steps you can comment down below. So this is all about How can you get iPhone Emojis for Android? Express your emotions by these Emojis which is better according to you. If you have any other method for this topic then Comment Below and if you have doubts then also comment below. Previous article9 Best Launcher for Android instead of a Stock ROM in 2017. Next article3 ways to enable Windows 10 dark theme to reduce Eye strain.